ASICS Greenville Track Club-ELITE athlete Josh Cashman ran 1:13:55 to win the 13th Annual Servis1st Bank First Light Half Marathon in Mobile, AL. The graduate of High Point University, where he competed in the middle distance events, ventured into uncharted territory at the half-marathon distance. Kimberly Ruck and Adam Freudenthal were featured in the Friday edition of The Greenville News, on the front page of the Sports section. Both ASICS GTC-ELITE athletes will be attempting to defend their titles at the Greenville News Run Downtown. ASICS Greenville Track Club-ELITE runners placed first in both the men's and women's competition at the 35th edition of The Greenville News Run Downtown 5K. Kimberly Ruck raced to a new course record of 16:55 on a very cold and windy Saturday morning in downtown Greenville as she won for the second consecutive year. Adam Freudenthal also defended his title as he crossed the finish line in 14:52--about ten seconds slower than his course record. Teammate Chris Caldwell was second overall. Kimberly Ruck returned to her alma mater and ran away from all competition on Clemson Univeristy's Indoor track. The former Tiger All American took the early lead and easily won the 5,000 meter event with a time of 16:42. She lapped everyone in the field and many twice as she won by 71 seconds on the 200-meter oval. Ruck's time converts to a 16:33 using the conversion adjustment for the 200 meter unbanked track. Chris Caldwell, placed 2nd in the men's 5,000 with a time of 15:01 (converted to 14:52) as the GTC-ELITE made their first indoor appearances in the group's brief history. Ricky Flynn, in his first competition as a ASICS GTC-ELITE athlete, ran his first race since June 2013 and placed third with a time of 30:16 over a challenging, hilly course. Flynn trailed winner Tyler Pennell of ZAP Elite (29:46) for much of the race and was in second position with less than 200 meters remaining before being passed by ZAP's Joe Stilin (30:14). Flynn's teammates Chass Armstrong (31:59) and Chris Caldwell (32:18) were also in the top ten with 6th and 8th place finishes. In the women's competition, Kimberly Ruck ran 34:49 to place third overall and improve on her 36:54/5th place finish in 2013. Both Ruck and Flynn earned $650 each ($400 for third places and $250 for being the first South Carolina finishers) in Greenville's oldest prize money road race. Armstrong won a total of $200 and Caldwell $50 as all four GTC-ELITE members earned prize awards. Ricky Flynn covered 10 kilometers in 31:41 to "Get to the Green" first and take home the $500 award for the winner. The annual Get to the Green event is one of Columbia, SC's largest running events and features a 5K and 10K race. Kimberly Ruck broke the Charlotte University Belk Track and Field facility record with her winning time of 16:20.68 for 5,000 meters in the 49er Classic. Adam Freudenthal followed Ruck's lead as he won the next event--the men's 5,000--in a personal best time of 14:26.08. Chris Caldwell, who shared the early lead, also ran a personal best with a time of 14:56. Former Clemson All American Kimberly Ruck ran to an unpressed victory for the second consecutive late Friday night as she won the women's 10,000 meters at the rain-soaked Raleigh Relays with an impressive time of 33:58.78. She finished almost 28 seconds in front of the runner-up at NC. State's Derr track complex. Ricky Flynn and Adam Freudenthal both ran impressive efforts over 5,000 meters Flynn, an NCAA DIII national cross country champion while at Lynchburg College, ran his first track competition in over a year as he ran 14:06.87 to place 14th in Section A. It was a good effort for him and coming less than a month after his return to racing after joining the GTC-ELITE group in December. Freudenthal, a former standout at Winthrop University, ran a personal best for the second consecutive week while placing second in Section B with a time of 14:15.27. Ricky Flynn ran 30:22 on a humid and windy morning to place 12th overall in the 37th annual Cooper River Bridge Run. Over 31,000 runners finished the 10-kilometer race, which included a 200-foot climb over the bridge, from Mt. Pleasant to Charleston, SC.The former NCAA DIII national cross country champion was the second American finisher, just three seconds behind Charleston's Michael Banks--the reigning South Carolina Runner of the Year (2013). The top ten finishers hailed from Africa and consisted of a mixture of Ethiopian, Moroccan and Kenyan athletes. Flynn earned $2,000 for being the second American. Three years following her graduation from James Madison University, Alison Parris joined the program after a collegiate career that included earning NCAA Southeast All Region honors in 2008, '09 and '10. She was the Colonial Athletic Association (CAA) cross country champion and Athlete of the Year in 2010 and also won the Eastern College Athletic Conference harrier title that year. An individual qualifier for the 2009 NCAA XC Championships, she also qualified for the NCAA Preliminary Round at 5,000 meters in 2011 and was the CAA 5,000 meter champion. Adam Freudenthal used a last lap kick to win the 5,000 meters in the 17th Annual Blue Shoes Invitational at Furman University on Saturday night in the venue's first meet conducted under the lights. Racing on the familiar surface of the track where he does much of his training, the former Winthrop star set a new event record with a time of 14:35.11. Recent Shawnee State University graduate Blake Wysocki joined the post-collegiate program. Runners and coaches from the ASICS Greenville Track Club-ELITE team, visited Christ Church Episcopal School and attended the morning chapel session to talk to the Lower School students about eating healthy food, exercising, and setting goals. Ricky Flynn returned to northern Virginia and competed in the 33rd edition of the Apple Blossom Valley Health 10K. The former Lynchburg College standout placed fifth overall and was the first American finisher while running 29:49. He earned $400 for his overall place and another $200 bonus as first American. Ricky Flynn ran to a new course record, but had to settle for second place in the Jail Break 5K in Lexington, SC. Flynn led much of the race, but couldn't match Charleston's Michael Banks over the final 500 meters as the former Georgetown University standout ran 14:26 to Flynn's 14:30. Ricky Flynn ran 4:57 per mile to finish 7th with a time of 1:04:50 at the Gary Bjorklund Half Marathon in Duluth, MN on a cool and misty early Saturday morning. He earned $600 for his placing, but more importantly gained the "B" standard and qualified for the 2016 USA Olympic Trials marathon to be conducted in Los Angeles. The program added Trent Binford-Walsh, a 2013 University of Pittsburgh graduate. Nicole DiMercurio, a recent graduate of the University of Georgia, joined the program. She had personal bests of 4:50 for the mile, 9:46 for 3,000, 16:28 for 5,000 and 34:30 for 10,000. During her senior year as a Bulldog, she placed 25th at the NCAA South Region Cross Country championships. On the track, she was 5th in the Southeastern Conference 10,000 and 8th in the 5,000. She completed her collegiate career by qualifying for and competing in the first round of the NCAA Track & Field Championships in both the 5,000 and 10,000. Adam Freudenthal and Alison Parris both ran to new course records in winning the Edouard Michelin Memorial 5K. Freudenthal led wire-to-wire as he clocked 14:43 to best the 15:01 record he shared with former teammate Chass Armstrong from last year's event. Parris, running in her first competition since joining the ASICS GTC-ELITE program in May, was timed in 16:52 and broke teammate Kimberly Ruck's year-old record of 17:38. Chris Caldwell followed teammate Freudenthal across the line as the runner-up, while Ruck bested her course record by 22 seconds in finishing third in 17:12. On a very humid and hot Labor Day morning in Columbia, SC, ASICS Greenville Track Club-ELITE runners placed in the money at the annual 5-mile event. Adam Freudenthal couldn't match the speed of Kenya's Cleophas Ngetich, who ran a blistering 4:44 per mile to win with a time of 23:45 and earn $1200 including the time bonus for running under 24:00. After a quick early pace, Freudenthal ran solo in second for most the race and finished with a time of 24:42, earning $100 for the runner-up position. Kenyan Sophy Jipchirchir used the same tactics as Ngetich, go out fast and keep going, as she replicated her countryman's victory and earnings ($1200) with her excellent 26:24 clocking. ASICS GTC-ELITE's Alison Parris was second in 28:12 with teammate Kimberly Ruck third in 28:34, both earning award money. Adam Freudenthal ran a personal best by well over a minute as he placed sixth at the 37th annual Great Cow Harbor 10K in Northport, NY. Passing the halfway mark in just under 15 minutes he ran a negative split over the final 5K to post a time of 29:48.12. The former Winthrop University athlete improved three positions and 73 seconds from last year's 8th place finish to earn $600 prize money. Kimberly Ruck improved her placing from last year by two spots to place 8th with a time of 35:33.14 over the hilly route on New York's Long Island. The former Clemson University All American earned $400 for her performance. Chris Caldwell and Alison Parris both ran to wins in the 8th Annual Benson OctoberFast Twilight 5K in Greer, SC. Caldwell took the lead early and ran just under 5-minute-per-mile pace to win the event with a time of 15:29. Parris was never challenged after a quick start and finished in 17:02, which is most likely the course record (pending further historical review). Both athletes took home cash awards in addition to the German flag awards representing the Octoberfest theme. Alison Parris and Adam Freudenthal both ran to victory in their initial cross country competitions of 2014. Parris started of the day by taking the lead in the second kilometer and leading to the finish on the rolling 5,000-meter course at Furman University in Traveler's Rest, SC. She finished with a time of 17:18. She was followed by her newest teammate and training partner, Nicole DiMercurio, who placed second with a time of 17:28 in her first competition since joining the group in September. In the men's competition, also over the 5,000-meter grass course, Adam Freudenthal pulled away from the lead pack and ran to victory in 14:52. Trent Binford-Walsh, running his first time in an ASICS GTC-ELITE uniform, recovered from a fall over a log obstacle on the course to place third with a time of 15:14. 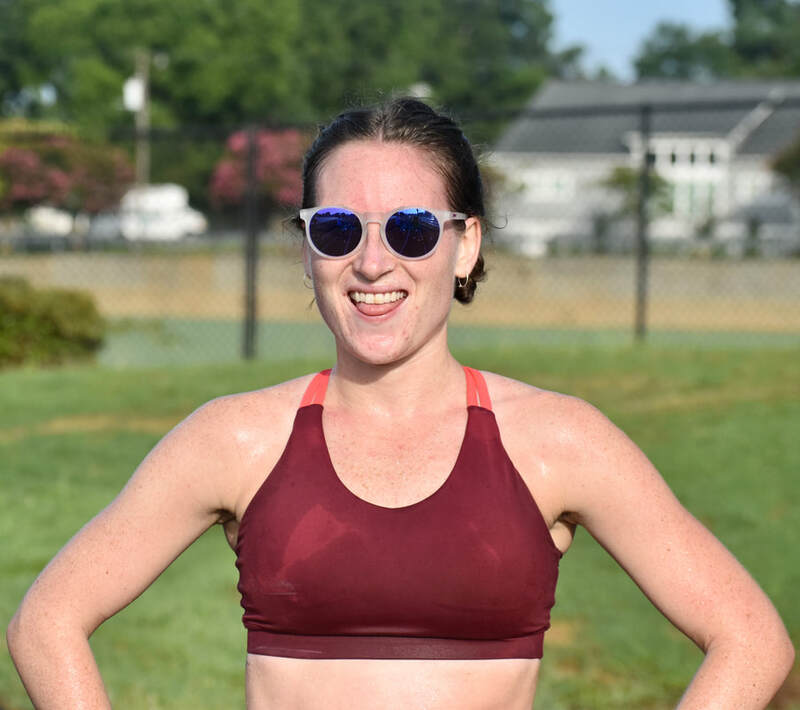 Kimberly Ruck ran 34:38 to place 30th in one of the deepest fields of women runners assembled this year at the 38th edition of the Tufts Health Plan Women's 10K in Boston, MA. The former Clemson standout cut 12 seconds off her time from last year, averaging 5:34 per mile pace, and improved two finish places. The race had over 5,000 finishers and is an annual Boston tradition on the second Monday of each October--as the city celebrates Columbus Day. Kimberly Ruck ran to victory in the 8K event at the 42nd Annual Governor's Cup Road Race in Columbia, SC on cool and brisk Saturday morning. She ran 27:38 to best her teammate Alison Parris, who placed second with a time of 28:17 over the rolling route though South Carolina's capital city. Ruck collected $250 for her performance, while Parris netted $150.In the men's competition the ASICS GTC-ELITE team placed second through fifth behind winner Cleophas Ngetich (23:47) of Kenya to win the team competition title. Runner-up Adam Freudenthal improved from his third place here in 2013 with a time of 24:03. He was followed in third by Trent Binford-Walsh in 24:23, Ricky Flynn (4th/24:42) and Chris Caldwell (5th/25:43). Freudenthal and Binford-Walsh earned 2nd and 3rd place award money. Kimberly Ruck cruised to victory in the Paris Mountain Flatlander 5K with a time of 17:11 on a wet and cool Saturday morning. The race was conducted on the beautiful Furman University campus in Traveler's Rest, SC. Ricky Flynn and Alison Parris placed well in their respective races at the 2014 USA Club National Cross Country Championships on the storied Lehigh University course in Bethlehem, PA. Flynn hung with the lead pack for the first few kilometers before finishing 21st with a time of 30:00.28 over the 10,200 meter rolling course. The men's competition had the largest number of entries in the meet's history with over 600 runners. Parris returned to a course that she competed on throughout her collegiate career at James Madison University and finished 33rd among the over 300 entrants. She ran 20:34.25 over the nearly 6-kilometer (5960 meters) course on the cold and windy day. Kimberly Ruck pulled away from her top competition over the final lap of the nine-lap criterium-style event to win the third edition of the Main Street Crit Elite 8K in downtown Columbia, SC on New Year's Eve. The former Clemson All American ran a quick 27:11 to best one of the country's top marathoners, Alissa McKaig, by four seconds to take home the $1000 first prize. She also broke her club's women's record for the 8K distance. In the men's competition, Ricky Flynn, also ran to a new ASICS GTC-ELITE 8K record of 23:39 in placing ninth.